"Crom was their chief, and he lived on a great mountain, whence he sent forth dooms and death. It was useless to call on Crom, because he was a gloomy, savage god, and he hated weaklings. But he gave a man courage at birth, and the will and might to kill his enemies, which, in the Cimmerian's mind, was all any god should be expected to do." -- Robert E. Howard: "The Tower of the Elephant"
Crom, the grim Lord of the Mound, lives atop a great mountain, sending forth dooms and death, caring little for mankind save to breathe into man's soul the power to strive and slay. He is the chief god of the Cimmerians. 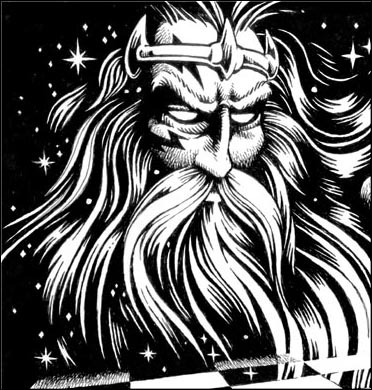 The Cimmerians believe in a gloomy afterlife in which the souls of the dead will wander Crom's grey realm aimlessly. It is useless to call upon Crom for aid "because he is a gloomy, savage god, and he hates weaklings". Crom does not send avatars into the world to meddle with the affairs of men. Some claim that the voice of Crom can be heard in the harsh winter winds of Cimmeria. Invoking Crom can bring either a doom or aid upon the target, with equal chance for each effect. Crom has few followers and no priests. Crom does not care to share his divine power with mortals. It is enough that he breathes life into mortals when they are born. Cimmerian religious ceremonies are minimal at best (prayers and supplications are useless, for it is better not to disturb this god lest he be resentful). Certainly ritual human sacrifice is not practiced -- for no Cimmerian would passively allow himself to be served up on an altar.